Winner Announced Of Jose Berrios Autographed Baseball! We have a winner! Congratulations to Kyle De Jong, our winner of the Jose Berrios autographed baseball! Kyle took advantage of the chance to invite friends, and when his friend Tyler Winthein entered, Kyle won extra chances and one of them hit! Kyle, congrats from Fan HQ and Twins Daily and we'll be in touch shortly to get you your baseball. Thank you everyone for playing, and don't despair - we have an even better giveaway scheduled for next week! Start lining up your friends now! Minnesota Twins starting pitcher Jose Berrios was named to the All-Star team! Twins Daily has been celebrating him since way back when he was still named 'J.O' so you can bet we're going to celebrate this! You can win an autographed baseball for the Twins new phenom, courtesy of Fan HQ and Twins Daily, absolutely free! Just enter here! Give enter your name and email. Signing up also automatically adds you to Twins Daily and Fan HQ's email list where we share Twins Daily stories a couple of times per week. If you do not wish to received these, you can unsubscribe at any time. The giveaway ends when the All-Star Game ends, so don't miss out. Make sure you share your link so you can get multiple entries! Pretty soon, you'll have every man, woman, and child with an internet connection in America posting on Twins Daily. Plus a billion Chinese folks, I suppose. What are you trying to do, give your moderators a heart attack? If our moderators could have heart attacks, they would’ve done so already. I concluded long ago they’re immortal. 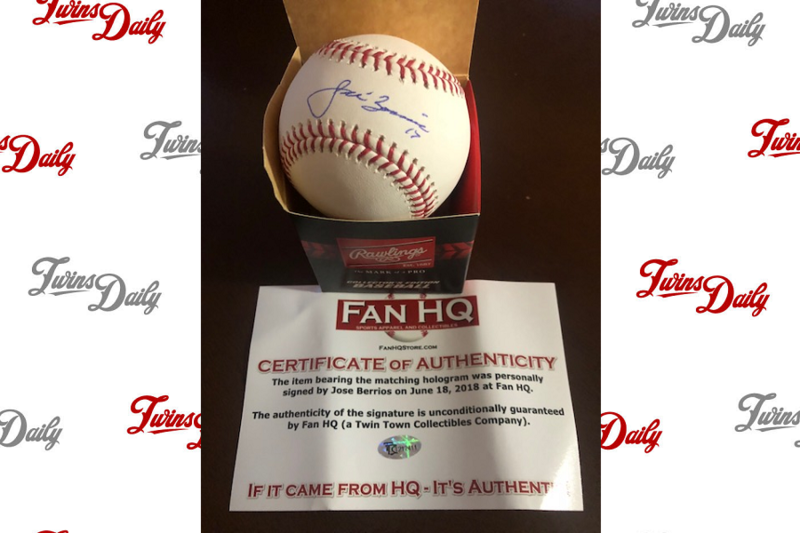 → Article: Winner Announced Of Jose Berrios Autographed Baseball!